I just realized that any spec of the MF that I look at don't show gunner bays. In one of the 4/5/6 movies, Han & Luke, are in their own gunner bay, with the remote control swivel seats firing their own guns. From specs that I find I don’t seem to see any gunner bays such as in this example below. Are these just bad specs? If so, can someone please send me a link to proper specs? In the movie, are they not almost 'back to back' but separated by a tube across the beam of the ship? Almost like they were in the escape pods? I see a 4 barrel gun on top - is there one under? Are the gunner bay windows actually concave (into the ship) then? So is the tube ventral to dorsal instead of across the beam? They're right in the images you posted. 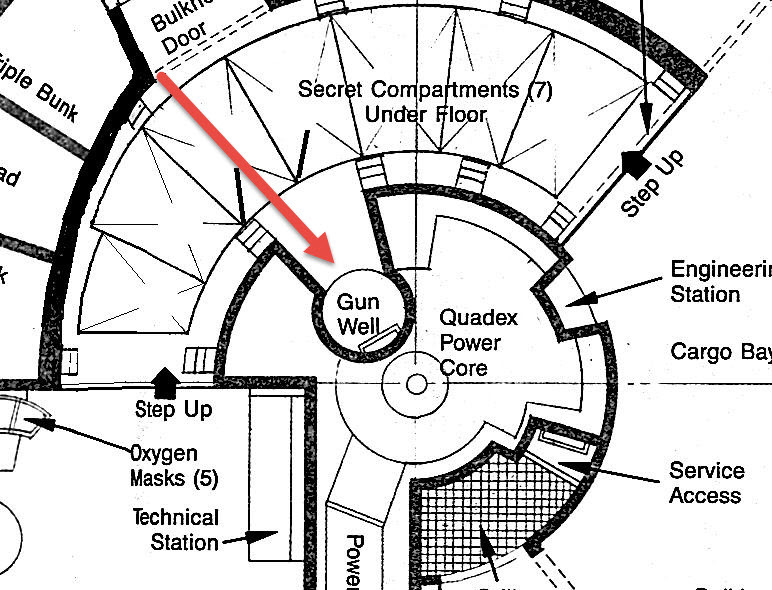 The turrets are labeled as "gun well" in the schematics. 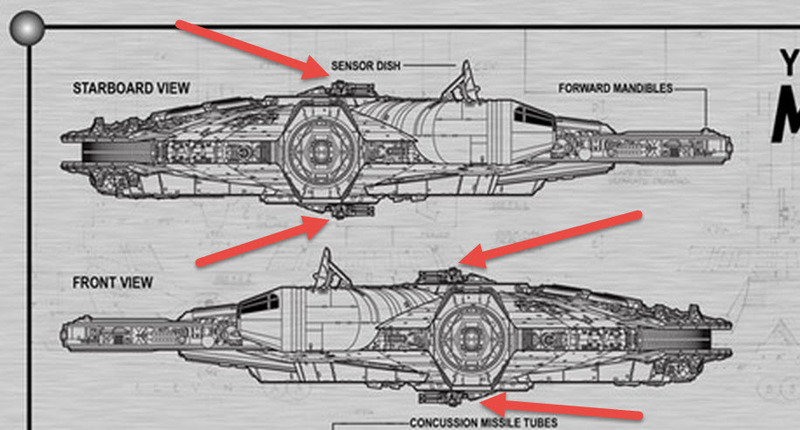 They are on the top and bottom of the Falcon. Zooming in on the profile shots, you can see both turrets. In those specs you linked you can actually see the gun wells. As you guessed, at both ends of it there is gun bays (one on top, one under). The trick might be how the gunners sit, that could be counter intuitive. I would say that with those specs you posted you pretty much have it. You just need to learn to read them. Check this page if you want to learn more about the ship. Whoops sorry about that. Answer wasn't finished but yes; the Falcon's write up in Dorling Kinderslay's Incredible Crossection states implicitly that the quad cannons are located dorsally and ventrally. The shots of the gunner wells in New Hope suggest control of the cannons is remote with the users' - if not being fired from the cockpit - sitting quite a ways away from the actual cannons. Surely the gunner operating the turret directly from within a protruding bubble like in a Republican Lartie would present too much risk to hull integrity in a deep space firefight. Not the answer you're looking for? Browse other questions tagged star-wars millennium-falcon or ask your own question. 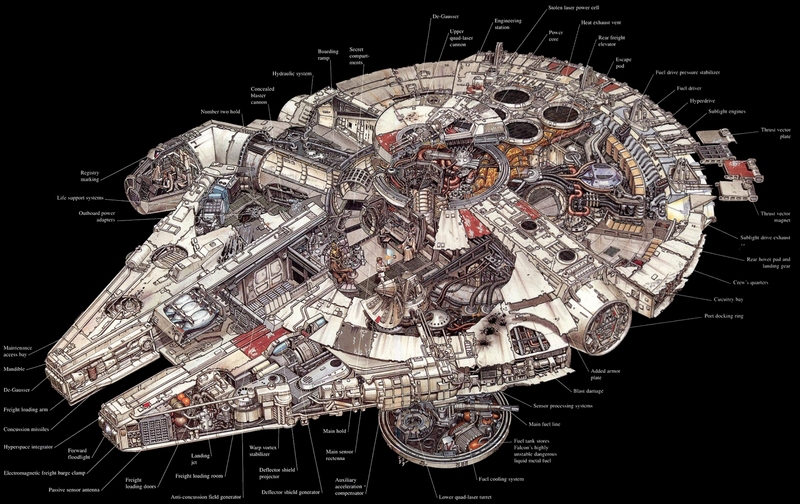 Is the name Millennium Falcon a reference to FALCON codes? 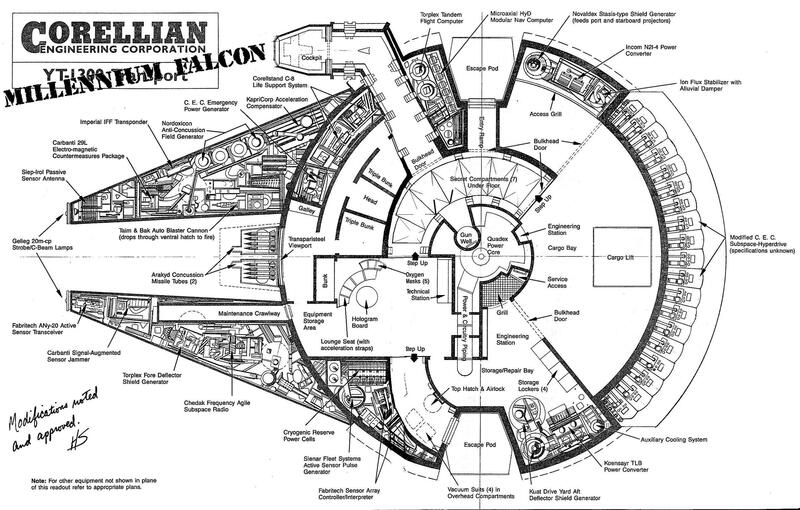 Who named the Millennium Falcon?